Canceled before AMC belatedly said, “Never mind,” The Killing more or less returns to the living Sunday with a two-hour Season 3 premiere preceding a new episode of Mad Men. Some reviewers griped long and loudly after Season 1 didn’t end with a revelation of “Who Killed Rosie Larsen?” Season 2 finally answered that question during the course of Seattle mayoral candidate Darren Richmond’s (Billy Campbell) highly improbable road to victory after first being a prime suspect and then getting shot and paralyzed. Richmond is neither seen nor mentioned during Sunday’s re-launch (June 2nd from 7 to 9 p.m. central). But for the record, it’s one year after the intersection of his election and the closing of the Larsen case. 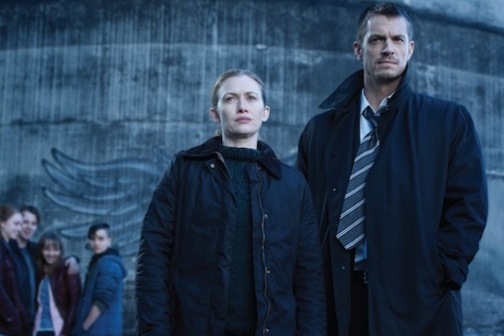 Sardonic detective Stephen Holder (Joel Kinnaman), easily the overriding reason to watch this series, has a new veteran partner after sulking, staring, emotionally bruised Sarah Linden (Mireille Enos) takes a minimum wage security job on an island 15 minutes outside of Seattle. Season 3 of The Killing(s) is further proof that just one murder is like playing tiddlywinks in these ongoing TV times of Showtime’s Dexter, Fox’s The Following and NBC’s Hannibal, which NBC last week renewed for a second season because its low overall ratings are sweetened by the show’s popularity among both the affluent and the young. All of those series are built on serial killer foundations, and now The Killing is following suit by piling up corpses of young runaways while also having another one go missing. Other potential targets remain, including featured ‘tude-copping teens known by street names of Bullet (Bex-Taylor-Klaus), Lyric (Julia Stone) and Twitch (Max Fowler). Kinnaman’s Holder has an especially well-played confrontation with Bullet after earlier going easy on her. Overcast, color-bleached Vancouver again stands in for Seattle, although Enos’ Linden is her own one-woman rainy day. Still wearing those impenetrable thick sweaters, she’s become a tiresome drain on this series. If only Holder could have gotten a new, snappier partner. Instead he’s stuck with her again in a rather laborious opening two hours that lack the initial spark and pop of those early Season 1 episodes. Additionally, Sunday’s final revelatory scene defies plausibility. How could all of those dead . . . well, you’ll see. Maybe The Killing will hit a firmer stride before crossing this season’s finish line. But the feeling persists that executive producer/writer/director Veena Sud again will come up short in what looks to be a last gasp. That initial heat from Season 1 has been lowered to room temperature. Kinnaman continues to give The Killing a pulse. But he can’t do it alone, and at this point merits a new, more vital vehicle in which he can really gun his engines.